Standard Shipping, "Best Way" to the USA is free when you order $75.00 or more. Standard shipping for most orders costs $4.50. Standard shipping for small orders, 1 or 2 small products, costs $6.50. Turnaround times: The Map Center completes most online orders on the same or next business day. "Best Way" shipping is usually First Class Mail. Larger orders may be sent via Priority Mail or UPS Ground. Time in transit depends on your distance from Rhode Island. 1 - 5 business days. "Priority Shipping" is usually Priority Mail. This may not save time if you are in the New England - New York area. 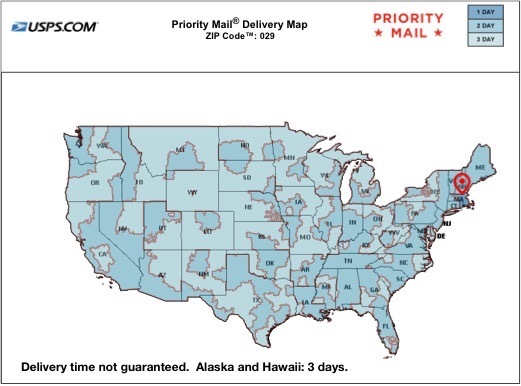 "Express Shipping" is usually Priority Mail Express, guaranteed overnight to many places in the USA. If you need absolute assurance of a certain shipping method or date, please order by phone or inquire first by email. If the webstore does not offer a shipping option that meets your needs, please inquire by email or phone. In the unlikely event that the webstore quotes a shipping charge drastically below our actual cost, we may hold the order and offer you a choice to approve additional payment or cancel the order. International Orders are welcome. Our charges are for postage and insurance. A tax, duty or fee added by the destination country may be due on delivery. Backorders: If you see "Availability: Out of Stock" on a product you may put it in your cart anyway. Our new stock may already be enroute. We can usually assemble a set of 100, 250 or 500 numbered maptacks even when the set shows out of stock. If the delay to complete your order will be more than 3 business days we will inform you by email. If we can ship more than half of your order right away, we will, and backorder the rest. If more than half of your products are on backorder we will email you to describe the situation and your options. Most backorders are filled in less than 2 weeks. Backorders are shipped at no charge. Sales Tax: On orders delivered to a Rhode Island address, we must collect 7% sales tax on merchandise and shipping and handling charges. Rhode Island Tax exempt purchasers must provide a copy of their certificate or letter from the Tax Administrator before we can process their orders without tax. Damaged Merchandise: If your package is damaged in transit do not discard the items or the packaging. Pack it back up as well as you can and let us know as soon as possible. We will arrange a prompt replacement of your order. Returns: Please order carefully. If you you feel less than fully confident that you have chosen exactly the products you want, contact us so we can clear up any questions you have before we execute your order. We prefer to work as hard as necessary to "Get it right the first time" and hope you appreciate our efforts to minimize trial and error shopping. If your purchase is not as you expected due to a factual error on this website or in any other communication from us we will correct the problem. ALL CLAIMS including for non-receipt must be made within 30 days. All other returns must be authorized by phone or email. Returned packages must be marked with our return authorization number. The customer is responsible for return shipping charges and properly repacking the merchandise. Credit will be issued only for merchandise received in new condition. Returns are subject to a 20% restocking charge. The Map Center will not accept delivery of any returned package that is not clearly marked with our return authorization number.